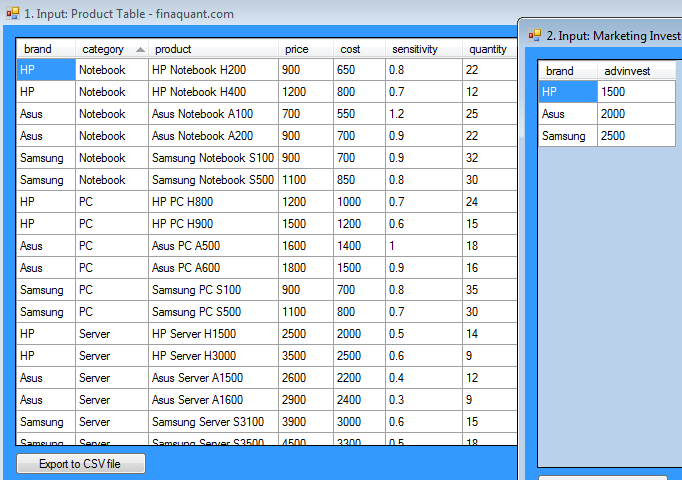 Table Functions of our .NET libraries finaquant® protos (non-commercial) or finaquant® calcs (commercial) can be used to formulate evaluation function (also known as objective or fitness function) and constraints in any optimization scenario quite easily without cumbersome database programming; following model example shows how. The output of an evaluation function can be measures like profit, time or costs, depending on the figure you want to minimize or maximize. 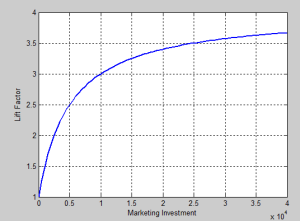 In the following example, we want to get optimal marketing investment amounts per brand (value drivers) in order to maximize total profit from sales. We will use Nelder-Mead Solver from Microsoft Solver Foundation (free .NET library) to find optimal investment amounts in this example. You may download the Visual Studio project file with all the C# code required to run this example here. An online digital products dealer wants to increase its sales through advertisements on internet. Each ad will promote a certain brand (i.e. ads at brand level). The increase in sales for each product depends on (1) investment amount, and (2) sensitivity α of the product. 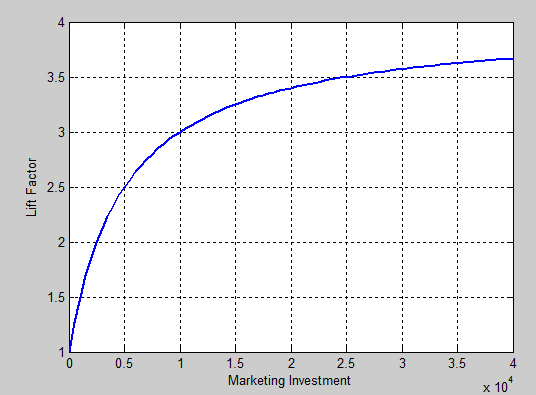 Marketing Investment table with initial (sub-optimal) investment amounts. 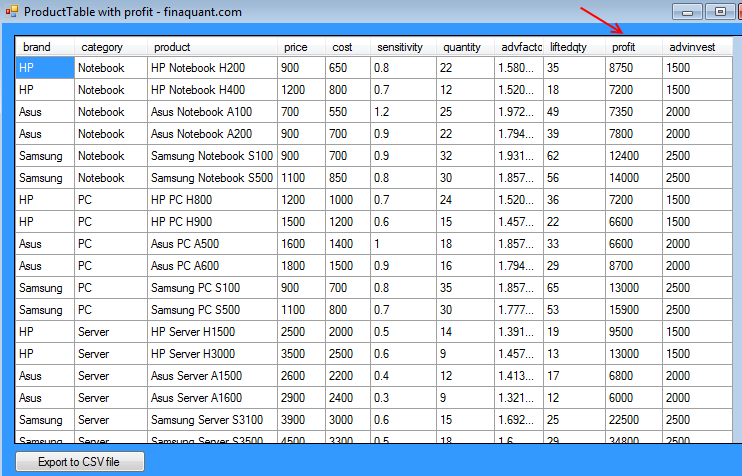 Following C# code shows how profit can be formulated with table functions. 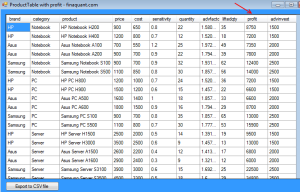 Note: Row Transformer (MatrixTable.TransformRowsDic) is used to apply user-defined formulas on each row of extended product table. 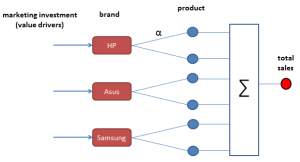 Following C# code shows how optimal investment amount for brand each can be obtained with the Nelder-Mead Solver for non-linear optimization models without constraints. In the code below, objProfit2() is the evaluation function. This example demonstrates that table functions can be used to implement complex evaluation functions based on data tables (i.e. input tables) in optimization problems. Similar optimization problems may arise in many business fields including operational research, risk analytics and financial planning. 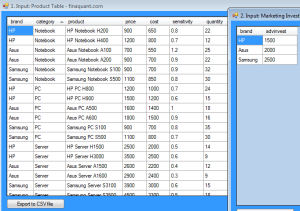 That is, table functions can be used to support better and smarter business decisions. This entry was posted in Calculation engine and tagged optimization, table functions. Bookmark the permalink.